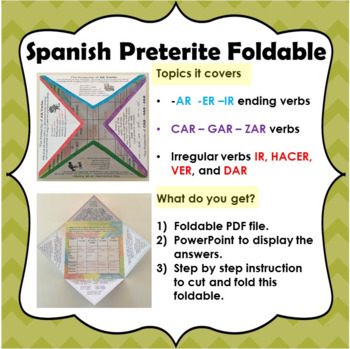 There are many Foldables and products that will help your students to better learn the Spanish preterite tense. However, this Foldable compiles everything a student needs to know about this tense. You could use this product as an introduction or a review of the preterite. It contains the endings and common verb examples of AR, ER, IR, and –CAR –GAR –ZAR verbs. Also, it shows students some of the most important irregular verbs in the preterite (IR, HACER, VER, and DAR). 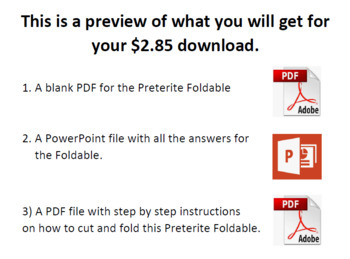 You will find this product very useful when you assign speaking or writing activities. Nevertheless, the most important use, in my case, is when I assign students workbook practice. 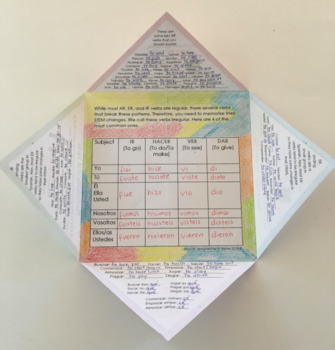 This powerful Foldable will help them conjugate almost any verb that they will find. I hope your students will have as much fun as my students did –not only creating it, but also using it!